The Incredible Hulk is a superhero film based on the Marvel Comics character the Hulk. It stars Edward Norton as Bruce Banner, Liv Tyler as Betty Ross, William Hurt as her father General Thaddeus "Thunderbolt" Ross and Tim Roth as the villainous Emil Blonsky, known in the comics as the Abomination. It is directed by Louis Leterrier and set for release on June 13, 2008 in cinemas worldwide. 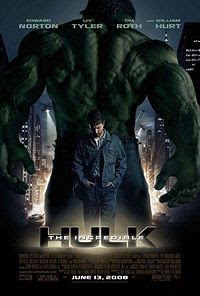 The film follows Banner as he flees the pursuit of General Ross while attempting to find a cure to rid himself of the Hulk. When Blonsky personally volunteers to be injected with Banner's gamma formula to aid Ross in his capture, he becomes an even greater monster, and Banner must accept his inner beast to defeat Blonsky. Ashley Tisdale Has HIV Positive?! I can't believe what I have been reading recently. There are some articles spreading in the Internet saying the Ashley Tisdale has HIV. Based from some Internet posts, she may have contracted the disease from her rhinoplasty procedure last year. I can't believe I even saw YouTube videos titled "Pray for Ashley." What?!! Are they really for real? Good thing PEOPLE cleared that online reports about High School Musical star Ashley Tisdale has been diagnosed HIV positive are "completely untrue", according to her rep Scott Appel. MTV Movie Awards 2008 Winners - Johnny Depp Rules! Johnny Depp won two major awards during the 2008 MTV Movie Awards held at the Gibson Amphitheatre, California on June 1. Wow!!! Looks like lead star behind Pirates of the Caribbean movie series is still as good as before. Actually, I like him as a star because I think he is great with genuine talent. No wonder he won the best villain and best comedic performance titles!